Junk your car - get Free Towing. 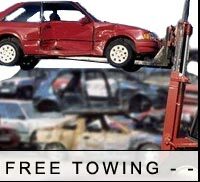 We offer free towing to our junk yards within 24-48 hours. Junkyard.org - The fast way to get rid of your old car. Call us today for junk car pick up! Free Auto Towing Services - Junk your car today! Free Junk Car Pickup. Junkyard Towing Nationwide. 1. What kind of junk cars do you accept? 2. The vehicle I'd like to scrap is not running. Will you still offer free towing? 3. Do you accept junk cars with mechanical problems? 4. My car did not pass the emission test? Can I still get free towing? 5. When will you pick up my junk car? 6. Do I need to be home when you pick up my car? 7. What if I don't have a title for my car? 8. Will there be any expense involved on my part, like towing charges? 9. How long will it take till my auto is picked up? 10. Do you offer Free towing services throughout the USA? 11. How do you determine the value of my car? 12. What are the tax benefits of donating a car? 13. My car doesn't have an engine, will you pick it up? We can accept most junk cars, running or not (exceptions include older cars whose value would not offset the cost of towing). To find out if we can accept your junk car, please call 888.511.JUNK, or fill out the Junk car removal form. Even if it failed the emission test we will still tow it for free. We will call you and arrange for junk car pickup at a time that is convenient for you. 6. Do I need to be at home when you pick up my car? In most case we can not pick up your car unless you have a title. There is no charge for our towing services. Never. The average pickup time for the towing services is 24-48 hours from your initial contact with us. 11. How much will I receive as a tax deduction for my used car? You'll receive a receipt for the full sale value of you car. 12 What are the tax benefits of donating a car? Junk-yard.org is a classified 501(c)(3) charity organization. You will receive a tax benefit when you junk your car. Check with your tax advisor or accountant to determine the amount of your benefit. 13 My car doesn't have an engine, will you pick it up? We can only pick up a car that are complete with all major parts. It's ok if your car is totaled. All Proceeds from our junkyard - - will benefit children in need Plus, you'll always get Free Towing!